Overview on the City and Interesting Places! 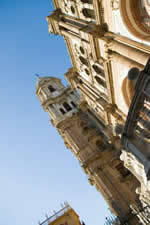 Granada Spain, together with Cordoba and Sevilla, is considered one of the three precious jewels of Andalucía. Its panoramic views which include the white tipped Sierra Nevada mountain range, rolling green hills and numerous monuments with their rich history, make Granada magical. The city took up where Cordoba left off in 1256. After Cordoba was conquered by the Cristians in 1256, the Muslim population fleed to Granada where Mohamed Ibn Ahmar founded the Nazarí dynasty. From 1238 to 1492, Granada acquired all its splendor both artistically as well as economically. It was in 1492 when the Catholic King, Fernando and the Queen, Isabel made King Boabdil surrender, but the city did not start to decline until 1609 when the Moorish people finally left. All these years of occupation were not in vane as Granada is blessed with an amazing Arab influence, architectural culture and remembrances. The Alhambra or Red Palace is without a doubt the most well-known monument in Granada, in Spain, and practically all over the world. We will start our excursion, on foot, from the New Square (Plaza Nueva) by climbing the slope called Cuesta Gomérez which is lined with handicraft shops or by getting the Alhambra bus which leaves from the center city. 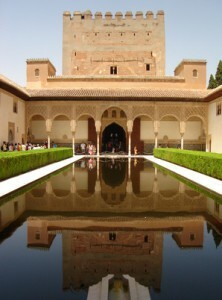 But before going into the Alhambra you should visit the Generalife Gardens which was the summer house of the Arab kings. The Alhambra is where we can see palaces, a citadel, and museums altogether. Let´s start the visit in the Presentation room where we get our first glimpse of the different types of techniques and decoration from the 14th c. The columns are the most notable reminder of the architecture also used in the Nazarí Palace. This style has its main function in decorating, causing us to see fascinating shadows and lights. The Albaicín (old Moorish neighbourhood) and Sacromonte come into sight at this point in our tour of the Alhambra. There are endless chambres such as the Throne room, and the Kings Chamber with its original Italian hunting scene paintings. As we leave the palace through the garden archway we can view the Palace of Charles V (Renaissance style). Here, under the same roof, is the Muslim Museum Spanish whose most famous possession in a blue vase (1,32 cm. high) and the Fine Arts Museum where we can contemplate religious paintings. The oldest monument, the Alcazaba (13th c.) or military quarters, makes us eyewitnesses of breath-taking scenic views of Granada. Taking a new route to see other attractions, we will leave once again from the New Square, we ascend the Carrera de Darro Street which takes us to “El Buñuelo”(the Arab baths) to continue on to discover the Archaelogical Museum with a Plateresque art entrance. Either on foot or by burro (donkey), we arrive at the Cármenes (adorable white houses with gardens) among churches, convents and town squares. From here we have a birds´ eye view of the Alhambra and in its background, the Sierra Nevada mountain range. Sacromonte is another area next Albaicín which is known for its flamenco, danced in the caves in these foothills. The shows are very authentic even though they are performed basically for tourists. The Festival of Music and Dance is celebrated from June 20th to the middle of July and it is the best of all these types of activities in Spain. 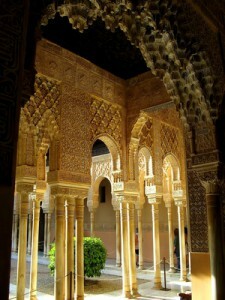 It is held in Generalife Gardens and in the awesome Patio of Charles V Palace in the Alhambra. You may have the chance to see internationally well-known flamenco dancers such as Joaquín Cortés or Antonio Canales. Just a short walk away in the Sacromonte Abbey; well worth the visit. 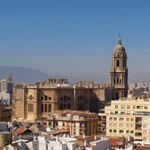 Back in the hub of the city, we direct ourselves to the Catedral neighbourhood. The presence of the Royal Chapel (Capilla Real) is magnificent. This was built by the Catholic King an Queen who wished to be buried in Granada, the place where Christianism was reunited. The maeble tombs of the kings and a splendid museum with famous artists are not to be missed. In any of the restaurats or local cafés in Granada, we will be able to taste the characteristic food such as lima beans with ham or the Sacromonte omelette. Light Sapanish beer, Moorish teas or wine are always on hand. In the Caldería Street there are delicious honey pasteries waiting for us. The Squares of Bibarrambla and Mariana Pineda are perfect for resting and having a light snack. These light snacks or “tapas” are usually cold small portions of meat, ham, fish or cheese, or small hot portions like grated bread with fish or meat. Mouth watering, really! About 32 km. South of Granada is the Sierra Nevada. Spring and Autumn are ideal seasons to go hiking, horseback riding or trekking. In winter it is a sports man´s delight with skiing, sleighing, going on a snow mobile, using inner tubes, ice-skating or just relaxing. Las Alpujarras is one of the most fascinating but unknown regions on the south side of the Sierra Nevada. Its distinctive scenery with over 65 different types of vegetation must be seen with your own eyes. There are many small towns to visit and lots of comfy places to stay. Guadix, to the east of Granada, is known for its caves, diversified architecture and beautiful Barroque facade of the cathedral. Granada, simple marvellous!